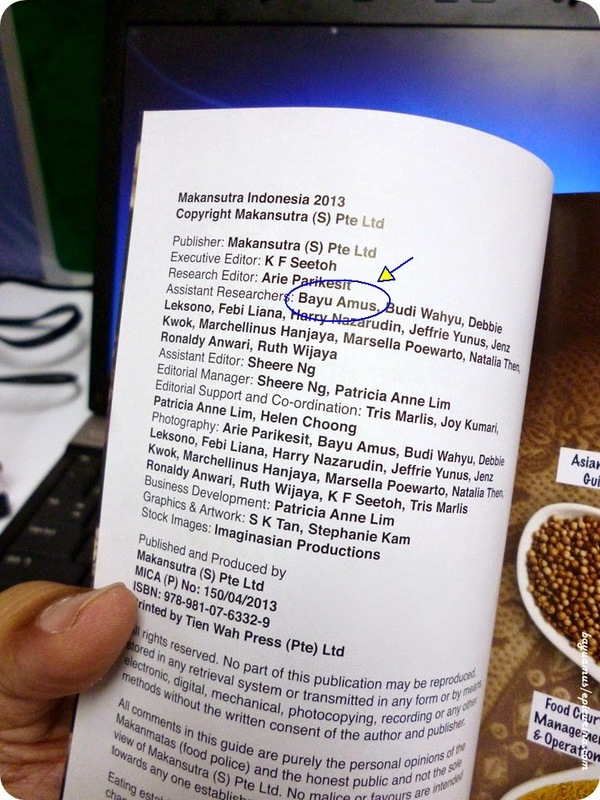 Epicurina - Bali Food Adventure Blog: Makansutra Indonesia 2013 is out! Makansutra Indonesia 2013 is out! "Makansutra Indonesia 2013" is the first food guidebook I contributed to, and I have so much fun doing all the research on the #streetfood of Bali -- despite the weight gains and cholesterol increases from having to review several dishes a night (and even more on weekends). Thanks to @arieparikesit for letting me join the team, @kfseetohsg and all the good people at @Makansutra for making this book possible, fellow researchers, and surely to my lovely @hypnoticade as the assistant-assistant-researcher :). Makansutra Indonesia 2013 book covers 500 eateries in Indonesia spanning three regions: Bali, Bandung, and Jakarta; all are tested and reviewed by dedicated Indonesian foodies, and to borrow Arie's word; while it's barely scratch the surface of Indonesia's best eats, but hey, this is only the beginning! Hi Pak Bayu, mau tanya nih, kedepannya apa Makansutra Indonesia bakal nge-cover kota2 besar Indonesia lainnya? Rencananya begitu, ada saran kota mana yang sebaiknya dimasukkan juga? Lalu, apakah Makansutra Indonesia ini bakal mengeluarkan edisi baru setiap tahunnya Pak?